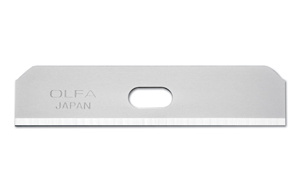 OLFA Safety Knife SK-7 Model 1077174. Handy sized safety cutter features a spring-loaded blade that self-retracts the instant it loses contact with the material being cut for increased safety in the workplace. Features a stainless steel blade channel that holds blade tight and a low-positioned blade slider that reduces blade exposure when carried inside a pocket. 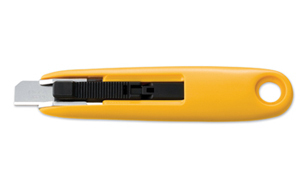 This lightweight cutter fits any size hand and is designed for right or left handed use. Perfect for safely cutting cartons, packages, poster board, cardboard, corrugate, boxes and more. Easy and safe blade replacement. Comes with 1 SKB-7 Blade. Uses replacement blades SKB-7/10B. Olfa Handles Are Guaranteed Forever.